Code Name Double Decker, PARANORMAL ACTIVITY 4! 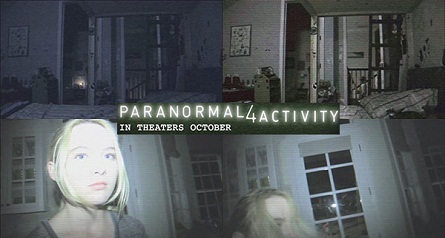 “Paranormal Activity 4” filmed a scene at the end of August this year where all was kept quiet on the set and the crew gave no hint or indication what the shoot was for code-naming it “Double Decker” and escorting background actors from a local school via “Paramount Studios” labeled shuttle buses to the secret location. Approximately two hundred women from the ages of 25 to 65 arrived to a residential location in Woodland Hills, Ca wearing all black outfits in order to look like witches. HOLLYWOOD JUNKET was lucky enough to be on the set during the filming of this scene. Here’s what we saw! New girl, Alice (Kathryn Newton) being terrorized by the Paranormal Activity evil energy, comes bursting through the doors leading into the backyard. When she gets outside, there is a huge group of witches all dressed in black welcoming her into their cove. Alice walks through the crowd as they make way for her. The next take of the same scene has Alice walking through the backyard full of witches with her laptop in hand and talking to someone via her web camera. Then suddenly, she is pulled up by an invisible force (really a harness) then drops her laptop. Her body then goes motionless. Paranormal Activity 4 features new girl, “Alice” to deal with the demon.